Blackberries are everywhere currently, so naturally a blackberry inspired dish had to occur! Blend oats into flour. Mix all ingredients except blackberries and sugar. Roll dough into two balls and flatten. Set on wax paper on baking sheet. 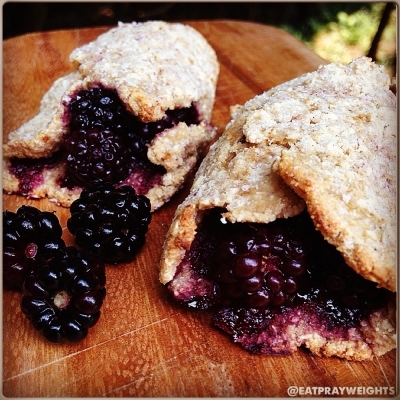 Place 1tbsp blackberry in center of each turnover. Sprinkle with a bit of sugar and roll it up. Bake at 350F for 15 minutes.